Encountering a squirrel or raccoon in your yard might seem like a positive experience. After all, these and other animals look incredibly cute. However, the common wildlife that once seemed cute can soon turn into an army of pests if you allow them to invade your home or yard. Once that happens, reclaiming your property can be difficult. 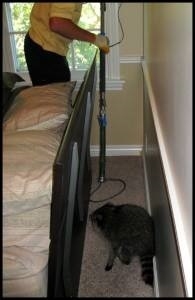 You need expert wildlife pest control from the Critter Control team. Unlike some wildlife pest control companies, Critter Control doesn’t deal with just a few species. In fact, our team’s members are highly trained to humanely trap, exclude, and remove all kinds of common wildlife pests, including squirrels, raccoons, and many species of mice or rats as well as less common pests such as armadillos and opossums. We use a variety of humane methods to remove live animals from your property and discourage them from returning. When you call us, we’ll inspect and analyze your home so we can formulate a customized wildlife pest control plan. We may start with traps or bait and then move on to using screens or sealing crawl spaces and voids to prevent future invasions. If you have an animal problem, don’t try to trap and remove a live animal or dispose of a dead one yourself. Instead, Contact Us or call Critter Control at 817-222-1101 for a thorough home inspection, analysis, and cleaning if necessary.